Sept. 24 | Experience the Fine-Dining Freakshow: 6 Course Chocolate Infused Menu with a Circus - EAT WITH HOP! Mast and Living Breathing Kitchen Serve Chocolate-Infused Fare To Accompany Sideshow Entertainment. Downtown, Los Angeles - On September 24, 2016, Brooklyn-come-Arts District chocolatiers, MAST, and Downtown Executive Chef, Robert “Bean” Castañeda, are opening the MAST facility to the public for a Chocolat Gala- a 6 course dinner with 4 pairing cocktails with a tour of the MAST factory. Alongside Chef Bean’s organic cuisine and cocktails will be dangerous and sultry live entertainment by Circus Maximus’ Vaudeville Freak Show and music by the Bastards of Belleville. This all-organic, all locally-sourced fine dining is a tour-de-stade of MAST’s catalog of fine chocolate served in an array of tapas and infused cocktails. These curated tapas feature MAST chocolate in ways never-before used by any kitchen, chef, or chocolatier. “This isn’t just pairings of good food with chocolate,” says Chef Bean, “we’re talking about white chocolate mole and roasting a pig in cocoa leaves- no chef has done anything like this.” Each carefully produced plate will be partnered with one of four signature cocktails from mixologist, Summer Titone, also featuring chocolate in an avant-garde way. With fine dining in his blood, Chef Bean learned from the masters and applied these lessons to his own craft. With a catalog of DTLA restaurants in his resume like Gorbal’s, Rocket Pizza, Prufrock at the Regent Theater, Cucina Rustica, and Fifty Seven, Chef Bean always aims to surprise his guests with unique experiences. In 2010, struck his own private claim with Living, Breathing Kitchen- a Downtown LA pop-up supper club that aims to bring conscious cooking to dense urban landscapes. MAST is a New York based chocolate maker with flagship locations in Brooklyn, Los Angeles and London. Founded by pioneering brothers Rick and Michael Mast in 2007, MAST is introducing chocolate to the world with an obsessive attention to detail, meticulous craftsmanship, groundbreaking innovation, and inspirational simplicity. 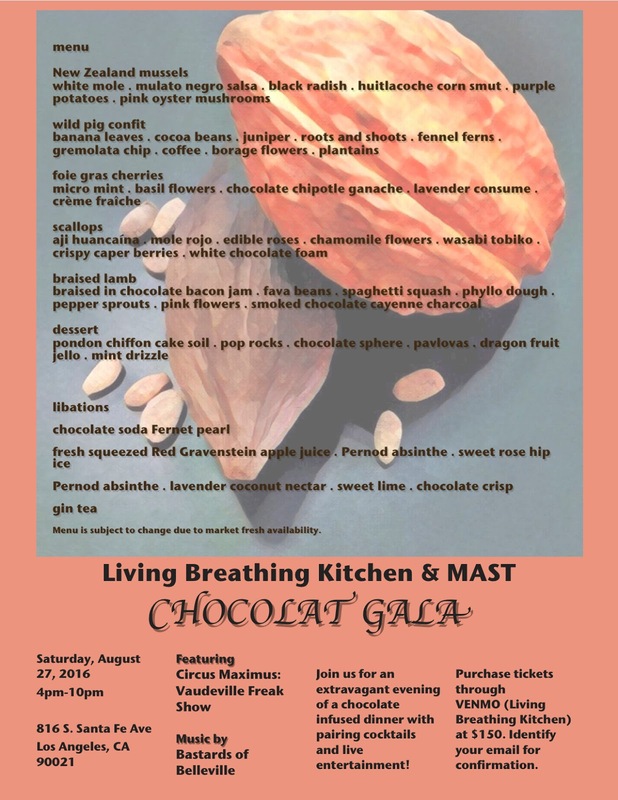 Living Breathing Kitchen’s next Pop­Up Supper Club, Chocolat Gala, will be held on Saturday, September24, 2016 from 4­pm - 10pm. Address for the event will be given upon ticket purchase. Tickets can be purchased through VENMO (Living Breathing Kitchen) for $150. Indicate your email as an RSVP and you will receive a confirmation email.